As we grow old the skin starts sagging especially around the jaw area and cheeks. This is not only due to the force of gravity but an aftermath of multiple complex processes. Technology is fast catching up to slow down the process of ageing and treat them to some extent. Sagging skin requires not one but multiple treatments. Using anti-ageing creams and medication as advised by the doctor is one way of keeping a check on ageing and its effects on your skin. Lately, with growing technology and expertise - anti-ageing laser treatments for skin tightening have also become quite popular amongst people. Our skin has a component called collagen that is necessary for skin flexibility. Over a period of time, its production in the body goes down. Laser treatment for ageing skin problems is focused on activating and rejuvenating our body to produce enough collagen. Targeted heating causes soft tissue coagulation and collagen contraction i.e. when the natural process of the body kicks in and gives the skin a youthful and tight effect. The full effect of skin tightening treatment can be seen over a period of few months. Avail an apt treatment for Skin Tightening in Mumbai at Sakhiya Skin Clinic. A lot of us do not want to go for invasive anti-ageing procedures like face lift etc. In such a scenario, non-invasive laser treatment for skin tightening becomes a great option. In this procedure, infrared light source is used to tighten the skin by heating the collagen under the skin’s surface causing the skin to contract. The effects of this procedure are noticeable immediately after the procedure and there is no downtime involved; making it an increasingly popular laser treatment for treating sagging skin. There can be a lot of reasons why the skin starts to sag over a period of time. This could be due to less production of collagen, reduced elasticity in the skin, inability of the skin to replace itself at the same pace, gravitational pull and others. Laser skin tightening is beneficial in all the above incidences. 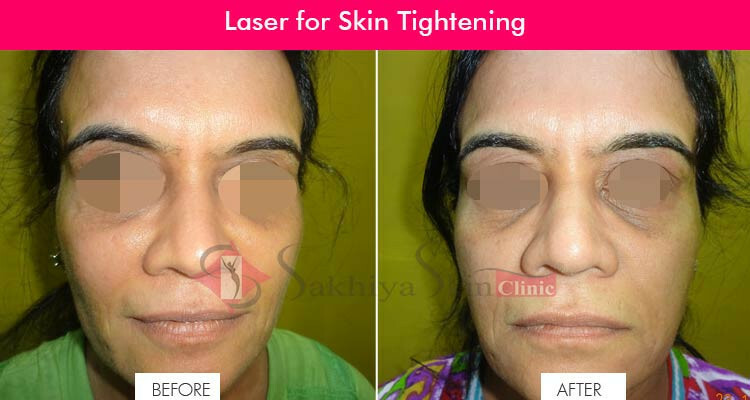 Skin Tightening Laser in Mumbai at Sakhiya Clinic is a very satisfying one. WHO IS SUITABLE FOR PROCEDURE? Ideal age is between 30 and 65. People in their late 20s can go for it if they wish to prevent themselves from the signs of sagging in the very beginning. HOW DOES IT FEEL DURING THE COURSE OF THE TREATMENT? You can feel the heat emitting from the laser light as it intends to heat the dermis. The good news is that the heat is bearable. Heat emitted from the laser is absorbed by the skin allowing the tissues to tighten up. Laser lift tightens and lifts sagging skin, smoothens wrinkles & creases and restores youthful contours of the face making you look young & radiant. High intensity focused ultrasound is a non surgical ultrasound & FDA approved treatment to lift and tighten sagging skin. HOW IS LASER TIGHTENING DIFFERENT FROM OTHER PROCEDURES? Laser tightening stimulates and repairs the existing collagen & help in the production of new collagen over a period of 2-3 months. HOW MUCH TIME DOES ONE TREATMENT TAKE? It takes around one to one and a half hour. Single session does produce skin tightening but repeated sessions are required for achieving effective long term results.